Routines, they’re the stuff a successful year is made out of. They are the difference between crying in the bathroom or dancing in the halls. (That goes for kids and teachers alike). Here are 6 tips to get you going and a list of 38 routines and procedures you must teach your students. Routines can be tricky to envision and even trickier to implement. 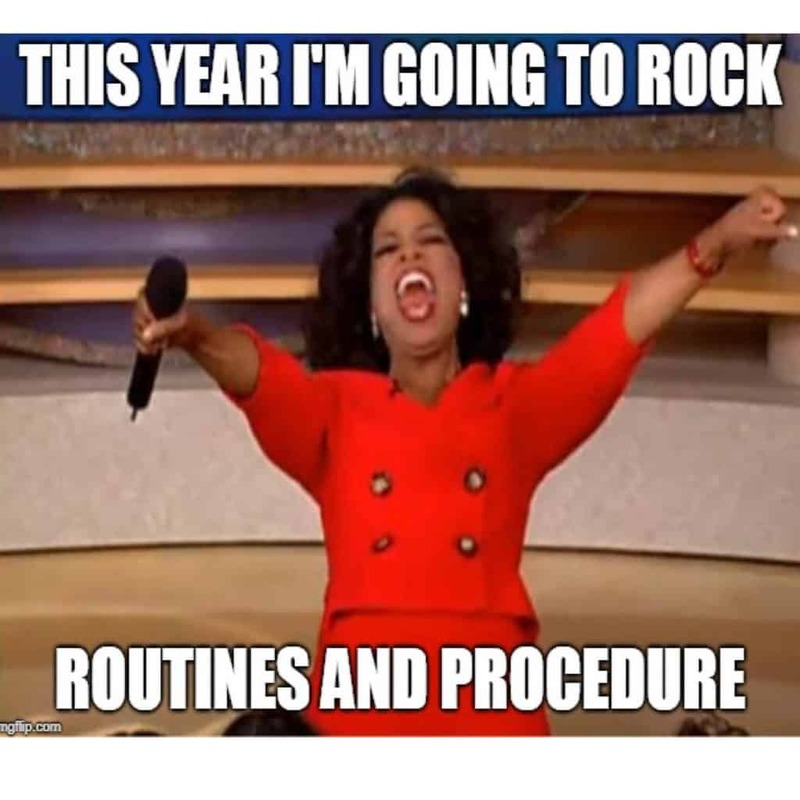 Here are 6 ways to rock the classroom with effective routines and procedures. Make sure to download your free 38 Classroom Routines and Procedures You Must Teach Your Students pdf. Place this in your teacher binder and refer to it when planning what procedures you have taught and the ones you still need to teach. Assume your students are little alien creatures who know nothing about school. Even if they are big 5th graders they have never been in your classroom before. They don’t know you and your expectations. Many times students will “misbehave” not because they are trying to be naughty. They misbehave because they don’t know YOUR vision about how YOUR classroom is run. Every year you get the opportunity to get a little bit better at managing your classroom than the year before. You are starting fresh and your students will perform to your expectations if you show them love, patience, and kindness. You are going to rock this!! Setting routine on the first day of school is optimal. Everyone (including the teacher) is on their best behavior, focus is high, energy is high, its a beautiful thing. But maybe you’ve been in school a week, or a month, or 6 months, and you are seeing yourself in need of some effective classroom management. It’s not too late and it’s definitely not too soon. Don’t get in over your head with this. Reflect and prioritize where you want to set up your routine. I like to start in the morning. I believe that when students walk into my room and know exactly what to expect and what to do, they are happier, and better able to focus on learning. Chaos is the grim reaper of learning and, if you are in survival mode, learning goes out the window. 4. Mastery takes time, time, time, time. Don’t expect to teach a routine and then have the students follow it for the rest of the year. Routines take time to establish. It takes some people 5 times of practicing it takes others 20 and still others 70. The key here is don’t get frustrated. Give yourself and your students the luxury of teach, reteach, reteach, reteach. Does that mean you will be teaching routine all year? Yep, to one degree or another you will. At the beginning it will be all consuming. You’ll think, “We are getting nothing done.” “When are we going to get to math?” Luckily with practice, it does get easier but I’m just here to tell you it doesn’t go away. Remember, you are there to teach them academics but also how to act in this world. We all know the later is probably the hardest to teach. It’s true. You lay a foundation, you put up the wall, you decorate and make it wonderful and just when you have it just like you want it, you move on to another house. The good thing is as the teacher you have the experience of the previous house (class) and you know what you want for the next house (class). It’s why they pay you the big bucks (lol) with the more experience you have. You’ve built a lot of houses and you should be sharing your house building skills with your neighbor across the street. There’s lots of times you may need to alter a routine. Maybe it’s just not working the way you envisioned it. Maybe your students are bored and the routine is actually starting to cause discipline problems. Maybe the routine is taking more time and energy away from the class than it is providing. So, how do you gracefully change it up without losing face with your students. Believe me, if you’ve done a good job of teaching a routine, they will notice when you one day just skip right over it. How Many Routines and Procedures Do You Have To Teach? Well I’ve made a little chart that I hang up in the classroom. It is full of all the routines and procedures that I’ve taught my class. It’s good for me to refer to to see which ones need to be retaught. I also use it to refer to when repeat routine offenders (You know the students who need to have lots of opportunities for practicing the routine over, and over, and over. Sigh!, Triple Sigh, sigh, sigh) are having a tough day. It’s a handy tool to remind them that there are expectation in the classroom and those expectations are so important they have been written down for the world to see. I would also place a copy in your teacher binder. I’ve shared this list with parents and administrators at various times. Mostly to illustrate that the day is full of not only academics but “Life” skills. You can use my little chart or you can make your own. I’ve made you a brand new border for you to use. Hot off the presses so to speak. I hope you use it again, and again, and again. What’s next? -Well Let's Just Say You Won't Want To Miss It. Well next week is going to be great especially for all of you who follow me through email. I will have a very big “Homework” product that I will be talking about and giving some free samples away. However, for all my email followers you will be getting the entire packet for free. Man, I love giving you guys stuff that makes your teacher life easier. So if you haven’t put you name and email into the little boxes below you can do that now. I will also send you tons of stuff associated with “The Blueberry Pancake Problem” book that I wrote. If you don’t know about the book you can watch the video and see if it is something you’d like. Now go be your amazing self. Teach those kids routines and be kind to yourself when life gets hectic. You are light, go shine bright.